The big picture: It’s that time again when Steam releases its monthly survey, giving us an idea of what hardware and software are most popular among the platform’s users. In the GPU charts, the GTX 1060 retains the number one spot, a position it has held since knocking the GTX 750 Ti off the top back in December 2017. The GTX 1060 saw its user numbers increase last month. It was up 0.50 percent, meaning 13.81 percent of survey participants now use the card. 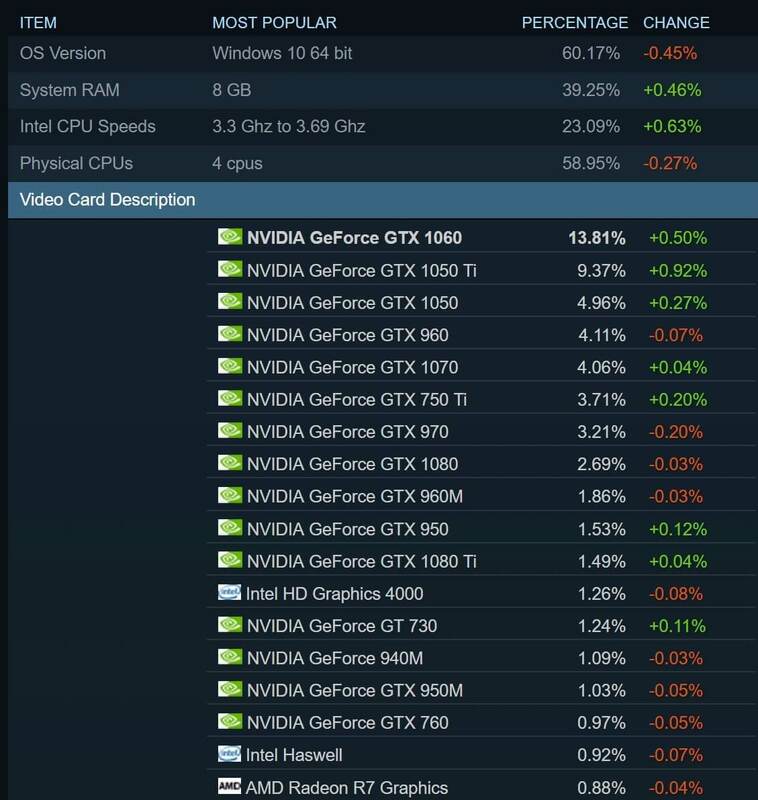 The two GPUs in second and third place—the GTX 1050 Ti and GTX 1050—also saw their users rise, by 0.92 percent and 0.27 percent, respectively. 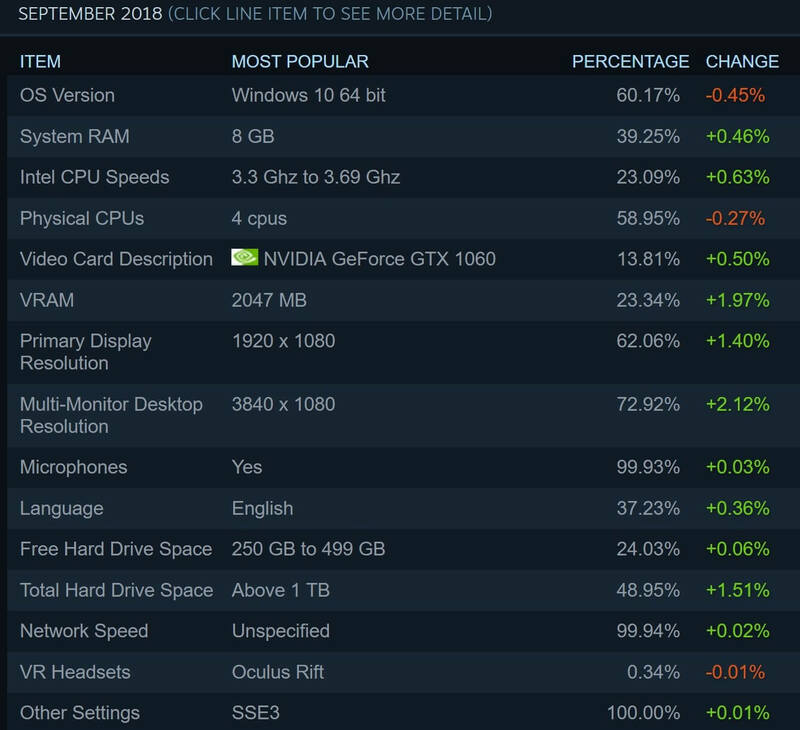 That means the GTX 1050 Ti claimed September's biggest increase. As usual, Nvidia dominates the GPU category; the highest AMD entry is listed as the R7 series in 18th place with 0.88 percent—down 0.04 percent last month. 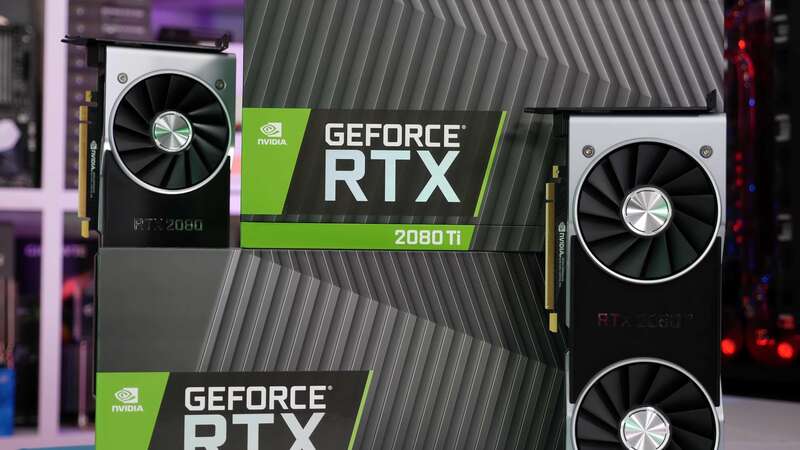 Not too surprisingly, there’s no sign of Nvidia’s new RTX 2080 and 2080 Ti cards, which launched late in September. With Nvidia pushing its RTX 2000-series cards' abilities to play games at 4K with high framerates, it’s interesting to see that not only is 1920 x 1080 still far and away the most popular resolution (62.06 percent) but it had the highest growth (1.4 percent) during September. 2560 x 1440 fell slightly to 3.59 percent, while 4K’s 3840 x 2160 stood at just 1.32 percent after falling 0.01 percent. When it comes to CPUs, Intel extended its lead over AMD. The blue team’s chips are now found in 83.89 percent of participants' PCs. Last month saw a report that AMD was set to capture 30 percent of the CPU market this year by capitalizing on Intel’s manufacturing problems, but it appears that’s yet to start happening, at least when it comes to Steam users who take the survey. In other areas, English remains the most popular language—it lost the top spot to simplified Chinese for a few months at the end of last year, mostly due to PUBG’s Chinese players. 8GB is the most popular amount of RAM, and most people have over 1TB of hard drive space with 250GB to 499GB free, along with a four-core CPU clocked between 3.3GHz and 3.69GHz.